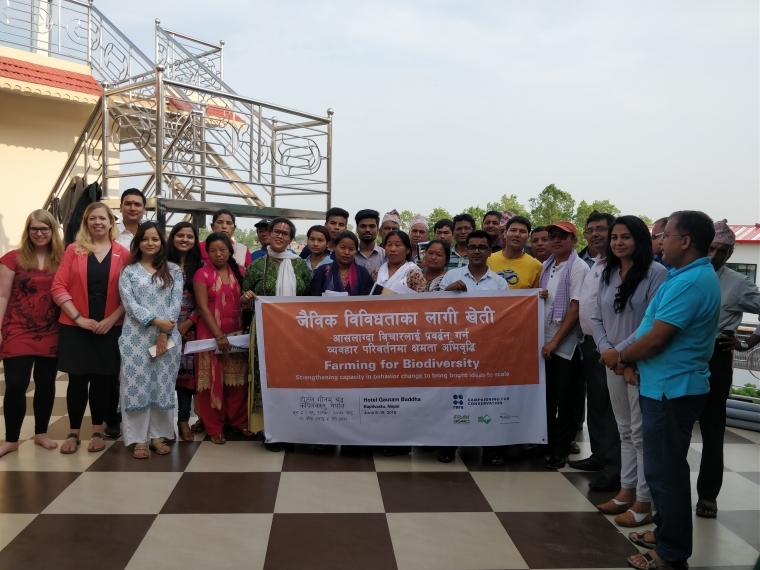 Campaigning for Conservation (C4C) was organized with the theme; “Farming for Bio-diversity” at hotel Gautam Buddha, Kapilvastu Nepal on 8th June 2018. It was a twelve days workshop which was jointly organized by National Disaster Risk Reduction Centre (NDRC), IFOAM ORGANIC INTERNATIONAL and Rare with the support of Federal Ministry for Environment Nature Conservation Building and Nuclear Safety, Germany. There were twenty-seven campaigners that participated from across the country Nepal. It was a privilege that I was one of them to represent YPARD Nepal. It was my first experience, participating in a training workshop with so long duration but I actively participated in every daily activity. So, it didn’t take many days for me as well as YPARD Nepal to be recognized and become familiar with all. During the workshop, I got to know more about NDRC and its activities particularly in Kapilvastu and Arghakhanchi districts of Nepal through the short introductory speech of Mr. Madhu Sudhan Gautam, the coordinator of the workshop. He mentioned that NDRC had been working on climate change issues related to agriculture and biodiversity particularly in those two districts since few years and this workshop was also a part of their project. The theme of the workshop was “The theory and practice of changing smallholder farmers’ behavior and fostering community support for the adoption of climate-resilient zero tillage agricultural practices”. The key lesson of the workshop were social marketing and change in behavior, understanding socioeconomic and environmental threats and other drivers, RARE’s theory of change, qualitative and quantitative research, data collection, in-depth interview & KAP’s survey, data analysis, audience segmentation setting, messaging, material design, organic agriculture production, markets and value chain support system, guarantee and policy and many more.